Do I Need an Annual Check-up on My Mole? Are you a Spring resident with a mole or multiple moles? If you answered, “Yes!” then you need to visit the dermatologist at least once a year for an annual check-up on your mole. The reason – moles may turn into melanomas, which are the deadliest form of skin cancer there is. But there is good news. When melanomas are detected early by your dermatologist, you have upwards of a 92% survival rate. Whether you were born with moles or developed them in childhood or even adulthood, you may notice that they look different now than they did before. That’s because moles may change in appearance over time. While some of these changes may be benign, or harmless, other changes may mean a dermatology patient has developed skin cancer. As Spring dermatologist Dr. Perri will tell you, symmetrically shaped moles are healthy. But if you have a mole that is asymmetrical, it could be a sign of melanoma. If, in between your annual dermatology appointments you notice an asymmetrical mole on your body, call Perri Dermatology for an immediate appointment. Healthy moles tend to have even borders. But if you have a mole with a jagged border, it’s time to see the dermatologist. Moles whose borders are uneven can be signs of melanomas. Moles come in various colors, but most moles are one complete shade of the rainbow. If you have a multi-colored mole, you’ll want Spring’s Dr. Perri to examine it for possible cancerous cells. Healthy moles tend to be no bigger than the size of a pencil’s eraser. 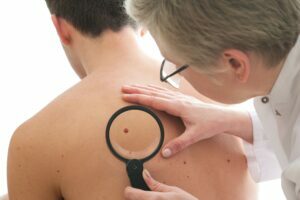 If you have a mole with a larger diameter, you’ll want to schedule a dermatology appointment to have it examined ASAP. As we’ve already mentioned, moles can change at any time, which is why it’s so important to have your moles inspected once a year. But if in between your annual appointments you notice a change in the mole, make a mid-year trip to Perri Dermatology so the mole can be inspected, and possibly excised and biopsied to determine if it contains cancerous cells. Unfortunately, many people underestimate the importance of annual skin check-ups, even if they have moles, and go years without a dermatological appointment, or have never even had one! This puts patients at risk. Skin cancer can appear on anyone of any skin tone, but the earlier it’s caught, the better your odds are of beating it. To schedule an appointment today with Spring’s Dr. Perri of Perri Dermatology – whether it’s your annual check-up or your first trip to a dermatologist – call our office today at (281) 943-2749.